Today, I wanted to review an eyebrow product that I just recently used from NYX. I have always wanted to try it, but my desired shade was always out of stock in my favorite online shop, Chic Princessa. After getting it, here is what I think about it. The eyebrow cake powder comes in a sleek black case covered with frosted plastic. My shade is ECP 01 Black/Gray because it matches my black hair. I don't really like browns for my eyebrows since they tend to mismatch and make me look weird. I bought this around Rp 88,000 (shipping fee not included) and I think it is quite a bargain, given that it includes two shades of eyebrow powder, a wax, a mini spoolie, and a mini angled brush. A very travel friendly product, if I do say so myself. The cake powders are highly pigmented, especially the darker shade. I usually use that to 'draw' the outline of my brow shape and filling them in with the lighter shade. I much prefer this type of eyebrow product nowadays because the pencil type runs out too quickly because I use it daily. Yes, yes, I'm not that good in shaping my brows. As for longevity, I tried using them with and without the wax after the powder is applied. 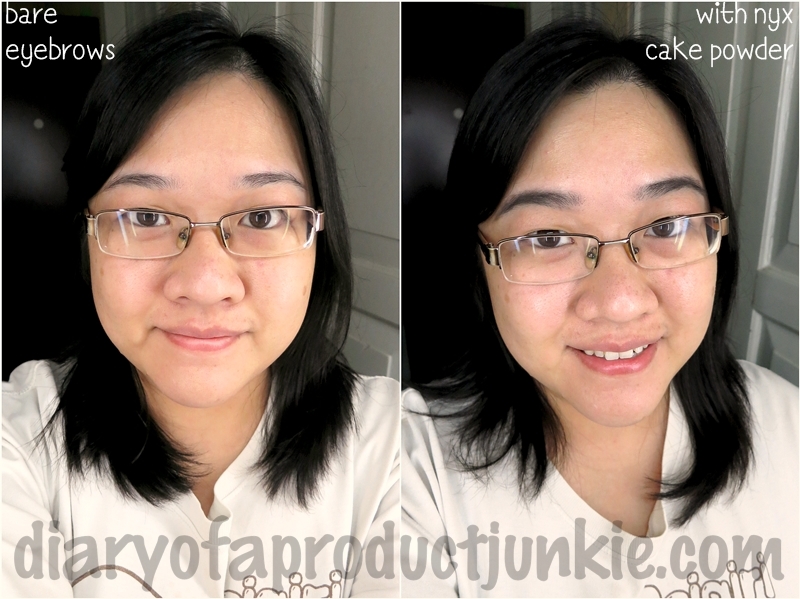 The wax definitely helps maintain the eyebrow cake powder appearance compared to not using the wax. If you have really sparse eyebrows, a pencil can come in handy to map out the shape of the eyebrow and later filling in with this cake powder. Overall, I am very pleased with this product because it is easy to use when filling in my brows. The wax is the right product to include in this set since it 'sets' the powder in place. It is also travel friendly because of the presence of tools such as the mini spoolie and angled brush. and i love how you fill in. so neat and natural looking! masalah cocok/ngga cocok ya kak kalo udah urusan beauty products :) whatever looks good on us mungkin ga cocok buat orang lain.. Btw, Slim Eye/Brow Pencil punya NYX juga bagus buat filling/outlining, but if the brows are too sparse, the pencil may look rather weird up there. Now that my brow's grown back already, brow powder-nya bisa istirahat dulu lah..